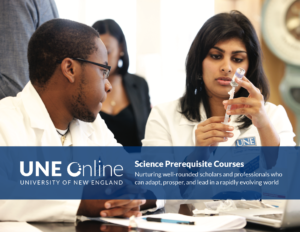 Thank you for your interest in the UNE Science Prerequisites for Health Professions classes! UNE is recognized as a leading educator of healthcare professionals. We are one of a handful of private universities with a comprehensive health education mission including medicine, pharmacy, dental medicine, nursing and an array of allied health professions. Through a firm commitment to excellence in online education, we provide students from all around the world a vast variety of quality resources. Our combination of expert faculty, advanced technology, and the highest quality course content ensures that the education received by our online student body is unparalleled. For more information, please fill out the form below to view the brochure.